Rebel Commandos are elite skirmishing units. They are able to hold a zone or flank on their own with minimal to no support and can handle any job given to them. 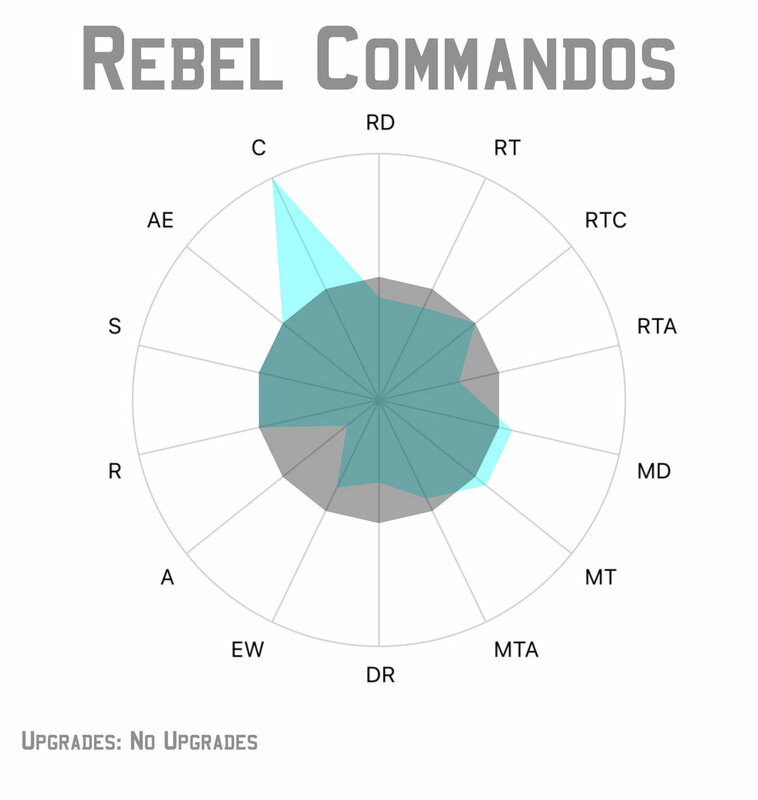 The base unit of Rebel Commandos are a bit awkward to analyze on their own, they fall in-between the 40 and 80 point bench marks and are more or less average in that space after taking all of their abilities into consideration. However unlike Corps troops, you are unlikely to take Commandos without a special weapon or upgrades and those change the unit drastically. For example, the Rebel Commandos have below average damage resistance but if they are equipped with Duck and Cover they can benefit from heavy cover even out in the open raising their damage resistance from 33.4% to 66.7% or above average (against weapons without Blast or Sharpshooter). However if we add on the Sniper to the unit we raise the points from 60 to 88 putting them clearly into the 80 point metric, but we find that their slightly below average damage increases from 2.5 to a still below average 3.5. However when considering the Sharpshooter 1 and Pierce 1 keywords we find that although they generate a below average amount of work, that work is more efficient and they are actually delivering an above average amount of damage against units in specific situations- specifically units in light or heavy cover (and an average amount of damage against units with no cover). It is also important to keep in mind their inherent courage 2 meaning their action economy is harder to slow down, and that in the worst case if they have to be promoted to your new commander your other troops won’t start fleeing. So we find that Rebel Commandos despite being expensive for the raw numbers they posses are actually a slightly above average efficiency unit when applied to the appropriate scenarios. Proton Charge Saboteur: The Proton Charge is an interesting weapon and needs a little explaining being the first Arm/Detonate weapon in the game. As an action the Commandos can place a charge at range 1 and in LoS, however this is not an attack action so the Commandos can place a charge and fire their weapons in the same activation (even the saboteur). Then after every action that happens, anywhere on the table, in LoS of the Commandos or not, there is a response window for the Commandos to detonate the charge initiating a ranged attack against every unit within range 1 of the charge. Note that this window to detonate is after every action including the one used to set it, so you can toss it out and detonate it immediately, but since it is at range 1 the Commandos will hit themselves with the blast. It is also important to remember that any friendly unit with the Detonate: Proton Charge ability can detonate charges, it doesn't have to be the unit who placed the charge. But now more about how this upgrade affects the unit; The Saboteur decreases the overall efficiency of the unit changing the units expected damage output from 2.5 to 3.125 however he gives them a new way to play which drastically changes their role on in the battle. The charge itself does an expected 1.625 damage to every unit within range 1, meaning its effectiveness can be massive if it hits more than one unit. More importantly the Proton Charges add a psychological threat to the enemies units and subtly control how and where the enemy moves. It can also strongly deter enemies from clustering together and make them cautious to approach key areas. Because of this the Saboteur is a more complicated piece to use than the Sniper, but potentially much more effective and is therefor a situationally recommended upgrade. The Rebel Commandos have upgrade slots for a Special Weapon, Training, Comm, Gear, and Grenade upgrade card. This makes them one of the most customizable units to date. The Gear upgrade is also a non-essential slot for Commandos and can be skipped if short on points. However if you are playing a Sniper with Hunter consider taking Targeting Scopes as well. The Grenade upgrade is another place you can save points on the Commandos since the grenades wont increase your damage output. The Concussion grenades are only improving your cover reduction by 1 since Commandos already have Sharpshooter 1. Impact Grenades are a good consideration if your army is otherwise lacking in ways to deal with Armor, but otherwise skip these as well. When Upgrading the Commandos it is very easy to overspend on them, keep in mind they are already up against the wall in terms of efficiency and the more upgrades you put on them the worse they get. Ideally when playing them you will keep the Commandos around the 100 points range if possible depending on the role you need them to fill and your playstyle. With the addition of wave 3 expansions the Rebel Commandos now have access to several new and useful upgrade options. Fragmentation Grenades: These are incredibly strong on your troops, although it is recommended on the Saboteur build and not recommended on the Sniper build. Frag Grenades change the 5 man units damage output from 3.125 to 4.375. Commandos can be as simple or complicated as you would like them to be and although they are a skirmishing unit they can play in two more specific styles depending on the special weapon you choose, so I will address them in two general styles; Snipers & Saboteurs. When playing the Commandos as a sniper unit you can play them fairly basically, as you would any other Rebel troop unit. But keep in mind that the sniper has unlimited range when you split fire and that the unit is at its most efficient against targets in cover. There are some interesting things to consider when playing Commando snipers over regular corps troops though. Because they have a courage value of 2 they can run fairly independently along a flank without greatly reduced risk of panicking. A corps unit will panic at 2 suppression, but a commando unit panics at 4 requiring the opponent to dedicate a lot more resources at them to slow them down. if you want to get fancier with them (and why wouldn't you?!) you can run them as skirmishers further away from your main force and harass the enemy from opportune positions. because they dont panic until 4 and have a strong chance of rallying they combo well with HQ Uplink allowing them to give themselves an order when needed as well as doubling the effectiveness of a ready action by removing the suppression and refreshing HQ Uplink. Whether you took HQ uplink or not, flanking is primarily how you will want to play the sniper variant. Another strong upgrade combo to consider with them is the Hunter upgrade, with the sniper you can split fire targeting a wounded trooper gaining an aim token, you can then fire the rest of the squad at different target using that aim token... and freeing up your other action you would have used to aim to move instead or even get an additional aim token - making this build very action efficient. If you take Hunter and gain a free aim you increase their total damage output from 3.5 from to 3.97 and if you took the targeting scopes as well to 4.2. Combined with Sharpshooter 1 and Pierce 1 against a unit in cover their actual damage throughput is 2.2 higher than what you would expect from a corps unit in the same situation. When playing the Commandos as a saboteur unit you can also play them simply like any other Rebel troop unit or as skirmishers like a base Commando unit, however they play much differently when you start to fully focus on the charge. Unlike the sniper variant the saboteurs will want to be right in the middle of the action to maximize the threat on their range 1 charges. Ideally the saboteurs will find a place near an objective early using their Scout 2 ability to get there before the enemy, and then cover the enemies approach in as many charges as possible. This should discourage the enemy from approaching and hopefully funnel them into tighter lanes of fire for the rest of your forces to concentrate on. If the opponent choses to proceed through the charged area anyways it is very important to keep in mind that you have a window to detonate after every action, so dont get greedy. It is better to wait and see if the opponent will put more units into the area before detonating - the more units you can hit with one charge the more valuable the saboteurs are. If the proton charge detonates on one unit it is adding 1.625 and an extra suppression to the units damage output which average or slightly above depending on how much value you place in suppression- but if you can hit multiple units the effectiveness of the charge can be tremendous. There are also some fun tricks to keep in the back of your head when playing saboteurs - firstly any friendly unit with the Detonate: Proton Charge ability can detonate and friendly charge of the matching name. This encourages saboteurs to be brought in multiples, when one dies the other can still make use of the existing charges. The second neat trick is that the range 1 on your charge isn't always a detriment. Although the normal action pattern for the saboteurs is to place a charge and then move away and detonate it (or save it), if you are able to get a dodge token either through a command card or an action it can sometimes be beneficial to place a charge and take the blast. The expected damage on a charge is 1.675 - if you have a dodge token that would be reduced to .675 however because the charge surges to crit and you cant dodge crits the actual number is .75 damage meaning you are likely to have 1 wound go through that you still get your 33.4% chance to save against - which means your actual chance of suffering damage is just barely under 50% (49.95%). So if you have a dodge token you can drop a bomb at the feet of an enemy unit (maybe even multiple) and detonate it immediately dealing .5 damage to yourself and 1.675 damage to each enemy, giving you both a suppression which means that they are more likely to lose an action, but because the saboteurs have already acted thats not a concern but they now benefit from Low Profile increasing their suppression into heavy cover... and if you are able to get the dodge token without taking an action you can also shoot meaning you potentially deal 4.75 damage and give yourself heavy cover at the 50/50 risk of taking 1 wound. When playing any flavor of Rebel Commandos though it is important to keep two things in mind that just like how their damage output is below average and increases to well above average when played appropriately - their damage resistance and attrition is the same. They have one less wound than the average for their points, and their native damage resistance is well below average if you aren’t keeping them in at least light cover. And also that you are paying for their courage value to make them an independent or a backup unit if your true commander dies. Keep their fragility in mind when playing them and target the appropriate enemies and they will do well for you, ignore those conditions and they will just be a more expensive more fragile corps unit. Because Commandos can be played in two different ways we need to talk about two different ways to counter them. When up against a sniper unit who is generally going to be further from the opponents main forces it is best to ignore them if you can, staying beyond range 3 - if you are able to do this then the opponent spends nearly 100 points on what amounts to 1 damage and 1 suppression a turn which is hugely inefficient and it allows you to focus your work elsewhere giving you a large attrition lead. If the sniper unit gets more into the mix then engage them as you would any other troop unit, especially with weapons that ignore or bypass their cover / low profile if you are able. Their low damage output means that they are primarily paying for their versatility and their independence and if they are not using those then you also have a small attrition lead in points. When up against a saboteur unit how to handle them depends on the objective and terrain. If it is an objective that doesn't require you to move to them then don't - engage them at a distance and they are wildly inefficient for their points. If it is a scenario where you do have to approach them then they should be your main focus (permitting that other units aren't more immediately threatening). In a scenario where you have to approach the enemy, the more turns the saboteurs have to prepare the more dangerous they become. If you are unable to remove the saboteurs before you have to make your push through their charged area try and do it with armored vehicle units first as they will take the least damage and suppression, and try to not pile up your units in one area, but dont be afraid of having a charge detonate on one unit as it isn't a ton of damage (although the out of turn attack and suppression can be disruptive). For the most part though, engage them as you would any other unit, possibly putting them a bit higher on the priority list than standard corps troops. Also keep in mind that their attrition and damage resistance are quite low, if you are able to attack them with weapons that ignore their cover they will be defeated quite quickly.